After years of planning and preparation, the Schulze Surgery Center opened in February 1997, and is the only accredited outpatient eye surgery center in Coastal Georgia specializing exclusively in eye surgery. Advantages to the patient of having surgery in the Schulze Surgery Center are many: first, because we specialize only in eye surgery, all of our personnel are uniquely trained and qualified to take care of your eye surgery needs. Secondly, because we are not a hospital (although licensed by Medicare, and certified through the Accreditation Association of Ambulator Health Care [AAAHC] to hospital standards of safety and quality) we do not have the expensive overhead and bureaucracy of a hospital, thus allowing us to keep our costs low while maintaining absolute control over quality, equipment, and personnel. Hence our facility fees are generally only about half of what are charged by the hospitals. Finally, the ambulatory surgical setting allows us to attain maximum efficiency, so patients typically can expect to arrive at the facility and leave, having completed their surgery, in under two hours. Patients undergoing excimer laser refractive surgery at the Schulze Surgery Center receive the latest in FDA approved laser technology with the VISX Star S 4 excimer laser. The VISX Star 4 laser is the only laser to track the eye in all 3 dimensions during the surgery. In addition, we were the first practice in the area to offer wave front analysis to our patients with the VISX WaveFront unit. Se our LASIK pages (LASIK for Myopia, LASIK for Astigmatism, and LASIK for Hyperopia) for more information. Dr. Schulze utilizes state-of-the-art techniques of topical anesthesia, foldable implants, and no-stitch surgery for the removal of cataracts. Patients are monitored during their surgery by Certified Registered Nurse Anesthetists (CRNA’s) to ensure comfort and safety during the brief procedure. Well over a thousand cataract procedures are performed each year at the Schulze Surgery Center, so you can be assured that Dr. Schulze and his staff have the experience to provide you with an excellent outcome after your surgery. 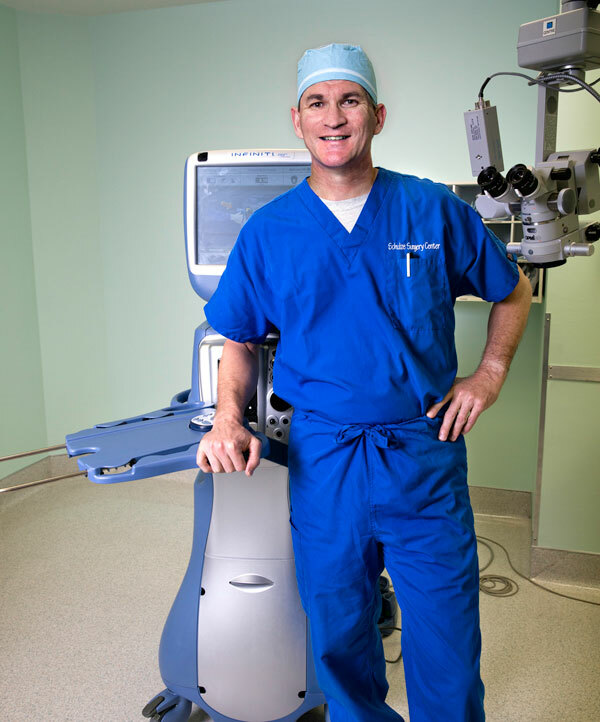 In addition to cataract and excimer laser surgery for refractive errors, the Schulze Surgery Center also has an Argon laser for treatment of retinal conditions and glaucoma, as well as a YAG laser for treatment of After Cataracts.